These amazing narcissus have stunning double centers, stripes, and frills that often resemble the appearance of a butterfly. 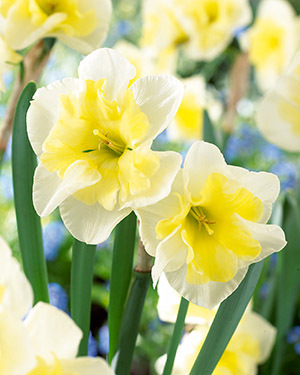 Narcissus are easy to grow in well-drained soil in full sun to partial shade and are well known to be deer resistant. Narcissus require minimum care. Allow the foliage to die back naturally. Lift dead foliage when it can be removed with minimal effort and these bulbs will return spring after spring.